Miroslava Breach was the third journalist to be killed this month in one of the most dangerous countries for media workers. 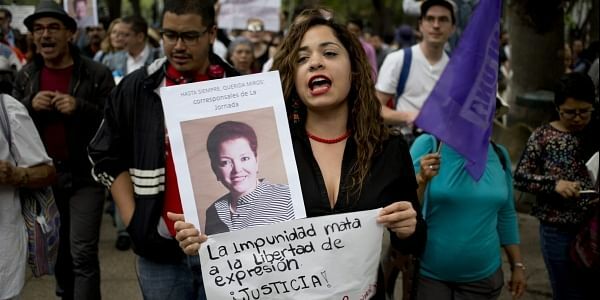 MEXICO CITY: About 100 journalists and free-speech supporters demonstrated Saturday to protest the killing of a Mexican reporter gunned down in the northern state of Chihuahua on Thursday. Miroslava Breach was the third journalist to be killed this month in one of the most dangerous countries for media workers. Those present held up signs with slogans like "Killing reporters doesn't kill the truth." Breach worked for the newspaper La Jornada. Judith Calderon of the La Jornada employees' union said her colleagues want an investigation into the killing. The killers haven't been identified, but Calderon said: "The attacks come from many sides." On March 19, newspaper columnist Ricardo Monlui was shot in the Gulf coast state of Veracruz. On March 2, Cecilio Pineda Birto, a freelancer, was slain in Guerrero state.